These Amazing Plants Thrive Indoors or Out! 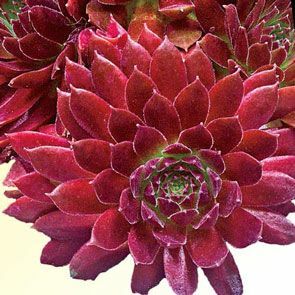 Hens & Chicks provide year-round beauty to both your garden and your home. 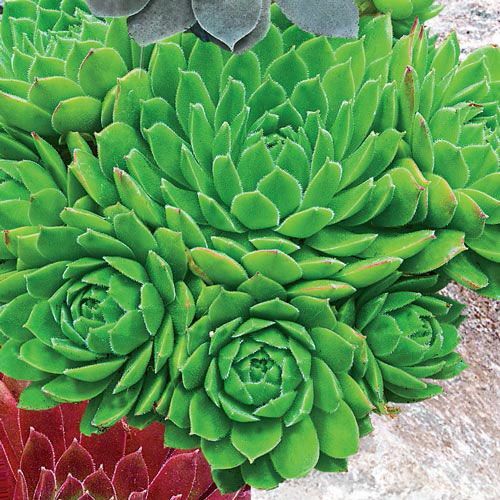 Extremely hardy and easy to grow, these colourful succulents won't lose their leaves in winter, so you can bring them inside for a lovely off-season houseplant, or just leave them in the ground—they are tough and winter hardy in zones 3-8! Even in heat, drought and poor soil, Hens & Chicks require very little water and minimum maintenance. For best performance and colour, all they need is plenty of sunshine. 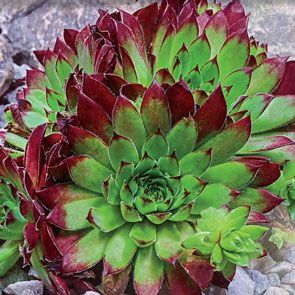 Hens & Chicks (Sempervivum) are quite versatile and spread quickly, filling in rock gardens or edging along walkways. 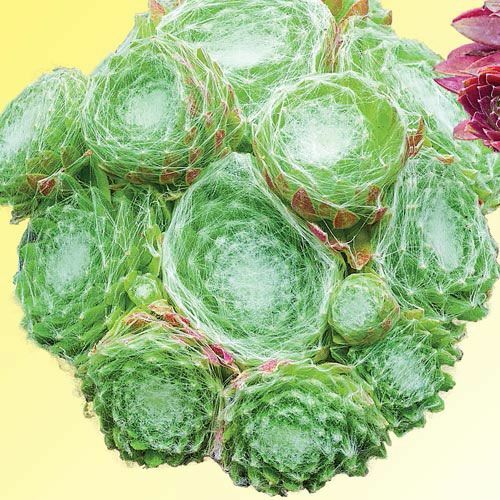 The main rosettes, known as the "hens," produce smaller rosettes, or "chicks." 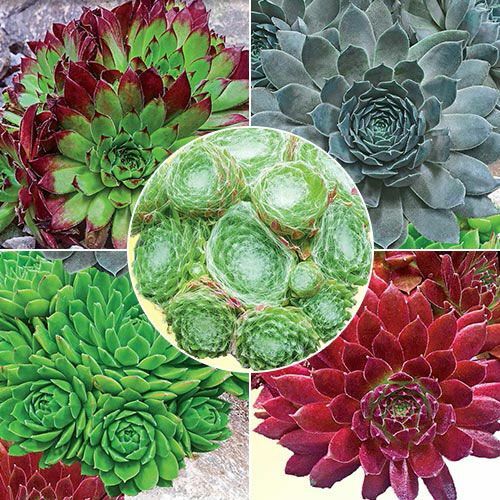 Because of their short roots, your Hens and Chicks will arrive in shallow pots, with one hen and 2-3 chicks each. Be sure to replant them in the ground or another pot as soon as possible. You can "pick a chick" at any time to plant in additional locations. Just stick the rosette in the ground and watch it take off! Spumanti: Small rosettes feature fine, silvery hairs that join together like a spider web among bright green, succulent foliage. Pink, bell-shaped flowers bloom in early to late summer. Grows 4" tall. Rita Jane: Jumbo-size, rosettes reach 5" across at maturity! 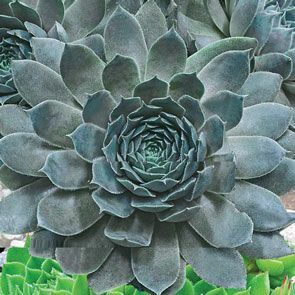 Grey-green foliage has a rosy base and matching red leaf tips. Grows 4-6" tall. Green Wheels: Layer after layer of apple green leaves form a dense carpet of medium-to-large, pointy rosettes. Early summer brings plenty of pink, bell-shaped flowers. Grows 6" tall. Emerald Empress: Deep silvery green rosettes get a bronze tint in cooler months. Short spikes of pastel flowers appear in early to late summer. Grows 2-4" tall. 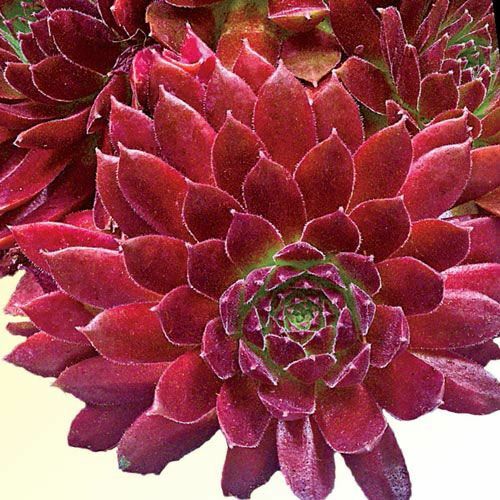 Red Rubin: Delightfully different! Burgundy rosettes have a hint of green peeking out from the tightly packed leaves. Grows 4-6" tall.